Kick off your Super Bowl party with this fiery hummus! 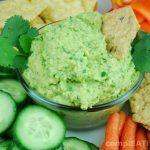 It's spicy, delicious, and great on veggies, chips, or whole grain crackers. This recipe takes less than five minutes to make, and is sure to wow your guests. Rinse the garbanzo beans until the water runs clear. Add all the ingredients to a food processor and blend until smooth.